The EPA pushed for nearly 25 years, to apply its Superfund program to the Gold King mine. If a leak occurred the EPA would then receive superfund status. That is exactly what happened. The EPA today admitted they misjudged the pressure in the gold mine before the spill - just as this editorial predicted. The letter was included in their print edition on July 30, 2015. Link. The spill occurred one week later. These are quotes from Lord Monckton from an interview with Breitbart. Monckton further explained that Francis is influenced by extremist Professor John Schnellnhuber, founding director of the Potsdam Institute for Climate Impact Research, who said in 2009 at a climate conference in Copenhagen that if we let global warming continue, six billion of the seven billion people on earth will be killed by it. Which by the way he thinks is a good thing!!! “In a very cynical way, it’s a triumph for science because at last we have stabilized something—namely the estimates for the carrying capacity of the planet, namely below 1 billion people.” Schnellnhuber said. In the “The Great Climate Change Denial Industry,” University of Connecticut geology professor Robert Thorson sought to discredit all dissent about climate change by tying it (falsely in most cases) to funding from the fossil fuel industry - niftily adopting the logical fallacy of ad hominem circumstantial while ignoring the fact that advocates of global warming alarmism get hundreds of times as much funding from governments (with their own biases) and alternative-energy corporations, making them subject to the same critique (still fallacious, but sauce for the goose is sauce for the gander). After sniping at religion (as if only fundamentalists are “climate skeptics"), bemoaning the decline in public fears of global warming but lacking the curiosity to ask whether there might be good reasons, and repeating the myth that polar bears are endangered, Thorson progressed to errors of fact and, well, more fallacious reasoning. like University of Alabama climatologists John Christy and Roy Spencer, who manage NASA’s satellite remote sensing program and together won NASA’s Exceptional Scientific Achievement Medal for their global temperature monitoring work with satellites. 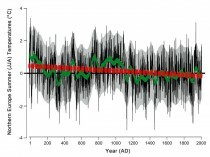 The Medieval Warm Period was warmer than now, and at least two periods since 1850 but before CO2 rose enough to contribute significantly had as rapid and as long upward trends in global average temperature as the warming trend from about 1977 to 2000 that some attribute to higher CO2. 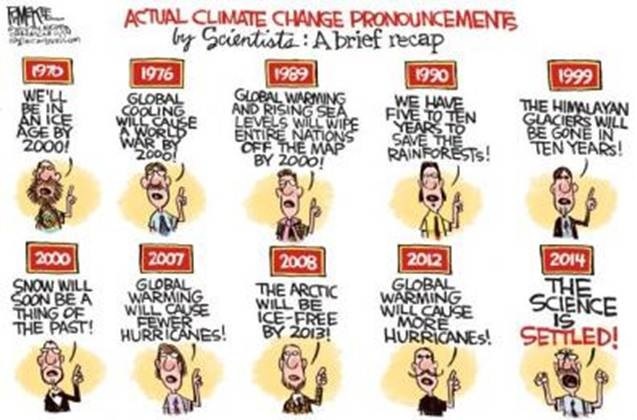 So “modern warming” is not unprecedented. Read more at Townhall here. The cardinal in the Vatican thought to be Pope Francis’s closest adviser this week criticized American critics of the Pope’s forthcoming encyclical on climate change as environment-destroying capitalist stooges. However, Thomas D. Williams reported in a 15th May story published on Breitbart that: “A Vatican insider asserts that Pope Francis has scrapped the draft of his encyclical letter on the environment and sent it back for major revision. The letter was slated for publication in early summer, but now may not be ready until much later, he suggests. Citing sources within the Santa Marta residence where the Pope lives, veteran Vatican journalist Sandro Magister has written that ‘Francis has scrubbed the draft’ of the text presented to him by Argentinian Archbishop Victor Manuel Fernandez, perhaps foreseeing that Cardinal Gerhard Muller of the Congregation for the Doctrine of the Faith ‘would have demolished it’ once it was presented to him for approval.” This is speculation, of course, but perhaps some of the remaining clear-thinking officials in the Vatican who have not been persuaded by Liberation Theology have realized that the energy-rationing policies demanded by global warming alarmists will consign poor people in poor countries to perpetual energy poverty. This Wednesday we mark Earth Day. A week from now, the Vatican will add its own contribution to what Pope Francis calls “human ecology” in the form of a summit called “Protect the Earth, Dignify Humanity.” The summit will in turn be followed by an encyclical some time later this year. The fears are not without cause. 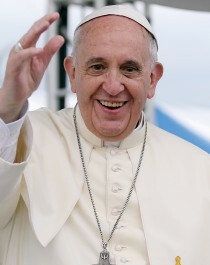 There are many signs that do not augur well, from the muddled section on economics in the pope’s first encyclical to his posing for a photo while holding up an anti-fracking T-shirt, to press coverage anticipating he will be to the fight against greenhouse gases what Pope John Paul II was to the fight against Soviet communism. Even so, the topic is ripe for precisely the kind of corrective a pope has to offer: a reminder that God’s creation is meant to serve man -not man the environment. And its corollary: It is the have-nots who pay the highest price for the statist interventions so beloved of the Church of St. Green. The Judeo-Christian view takes its lead from Genesis 2:15: “The Lord God took the man and put him in the Garden of Eden to work it and take care of it.” Plainly this imposes on mankind an obligation of stewardship. And yes, we can all think of people and regions that have suffered because someone exploited an area for private gain while dumping all the costs on the public. Still, the first part of that Genesis passage means something too: that the earth is to be worked, and that this work and the fruit it bears are also blessed. After all, what is work but the application of human ingenuity and labor to God’s creation to increase God’s bounty? For Genesis also tells us we are fashioned in the image and likeness of our Creator. In a sense this means we are at our most human when we use our God-given talents to participate in acts of co-creation. How different this is from the narrative that dominates the conversation on the environment, and especially the conversation on climate change. All too often the vision of man here is as the despoiler, speeding the planet along the path to doom and destruction. When this thinking is taken to its logical conclusion, it’s not Swedish or American women or their babies who find themselves targeted. It is African women and African babies, Chinese women and Chinese babies, Indian women and Indian babies, Latino women and Latino babies, and so on. Something, perhaps, for the pope to ponder next time he’s in the mood to preach against noxious Western exports. Meanwhile, encouraging a sturdier appreciation in the green movement for man’s ability to use his mind to find solutions for the earth’s problems would help. Take, for example, two popular targets of the environmental movement: chemicals and fossil fuels. Those of us who get our fruit and vegetables at Whole Foods may have a hard time appreciating the scourge that insects, parasites and disease are to those in poorer parts of the world. Or the high price these people pay when they are denied these man-made tools in the name of some environmental fad. How many African children died, for example, when the use of DDT on the continent - arguably the most effective anti-mosquito insecticide - declined after the U.S. banned it in 1972 on the basis of pop science? Along the same lines, when we measure the costs of fossil fuels, shouldn’t we include the human costs that result when restrictions on fossil fuels would mean denying hundreds of millions of people in the developing world the life-enhancing improvements that come from cheaper energy? In its unwillingness to consider such trade-offs, modern environmentalism at times takes on the aspects of an authoritarian religion for the wealthy, with its own Eden (earth before man ruined it); its heretics (skeptics about man’s contributions to global warming are “deniers"); and its indulgences (make up for your corporate jet by driving a Prius). All well worth not only mentioning but highlighting, especially in a papal effort that aims at putting the human back in human ecology. Read here about Pope Francis’s conference on the environment April 28th, in advance of addresses at a joint session of Congress in September, the U.N. General Assembly in New York, and his December speech at the U.N. Climate Conference in Paris. Read this insightful Letter from Rome: What will Pope Francis say about the environment? by Kishore Jayabalan of acton.org. * Central Pacific region temperature dataset SST3.4 from 1990 to 2014 is studied. * SST3.4 contains a sustained signal at 1.0 cycle/yr implying solar forcing. * SST3.4 also contains a signal (<1 cycle/yr) showing El Nino/La Nina effects. * This signal contains segments of period 2 or 3 years, phase locked to the annual. * A 12-month moving average improves on a "climatology" filter in removing annual effects. Equatorial Pacific Ocean temperature time series data contain segments showing both a phase-locked annual signal and a phase-locked signal of period two years or three years, both locked to the annual solar cycle. Three such segments are observed between 1990 and 2014. It is asserted that these are caused by a solar forcing at a frequency of 1.0 cycle/yr. These periodic features are also found in global climate data (following paper). The analysis makes use of a twelve-month filter that cleanly separates seasonal effects from data. This is found to be significant for understanding the El Nino/La Nina phenomenon. * Global ocean temperatures at depths 0 - 700 m and 0 - 2000 m from 1990 to 2014 are studied. * The same phase-locked phenomena reported in Paper I are observed. * El Nino/La Nina effects diffuse to the global oceans with a two month delay. * Ocean heat content trends during phase-locked time segments are consistent with zero. In part I, equatorial Pacific Ocean temperature index SST3.4 was found to have segments during 1990-2014 showing a phase-locked annual signal and phase-locked signals of 2 or 3 year periods. Phase locking is to an inferred solar forcing of 1.0 cycle/yr. Here the study extends to the global ocean, from surface to 700 and 2000 m. The same phase-locking phenomena are found. The El Nino/La Nina effect diffuses into the world oceans with a delay of about two months. Time evolution of growing season temperatures in the Northern Hemisphere was analyzed using both wavelet and Fourier approaches. A century-scale (60-140 year) cyclicity was found in the summer temperature reconstruction from the Taymir peninsula (∼72N, ∼105E) and other high-latitude (60-70N) regions during the time interval AD 1576-1970. This periodicity is significant and consists of two oscillation modes, 60-70 year and 120-140 year variations. In the summer temperatures from the Yamal peninsula (∼70N, ∼67E) only a shorter-term (60-70 year) variation is present. A comparison of the secular variation in the Northern Hemisphere temperature proxies with the corresponding variations in sunspot numbers and the fluxes of cosmogenic 10Be in Greenland ice shows that a probable cause of this variability is the modulation of temperature by the century-scale solar cycle of Gleissberg. This is consistent with the results obtained previously for Northern Fennoscandia (67-70N, 19-33E). Thus, evidence for a connection between century-long variations in solar activity and climate was obtained for the entire boreal zone of the Northern Hemisphere. Esper, J., Duthorn, E., Krusic, P.J., Timonen, M. and Buntgen, U. 2014. Northern European summer temperature variations over the Common Era from integrated tree-ring density records. Journal of Quaternary Science 29: 487-494. In a paper published in the Journal of Quaternary Science, Esper et al. (2014) write that tree-ring chronologies of maximum latewood density (MXD) “are most suitable to reconstruct annually resolved summer temperature variations of the late Holocene. : And working with what they call “the world’s two longest MXD-based climate reconstructions” - those of Melvin et al. (2013) and Esper et al. (2012) - they combined portions of each to produce a new-and-improved summer temperature history for northern Europe that stretches all the way “from 17 BC to the present.” And what did they thereby learn? As the international team of researchers from the Czech Republic, Finland, Germany, Greece, Sweden and Switzerland describes it, this history depicts “a long-term cooling trend of -0.30C per 1,000 years over the Common Era in northern Europe” (see figure below). Most important of all, however, they note that their temperature reconstruction “has centennial-scale variations superimposed on this trend,” which indicate that “conditions during Medieval and Roman times were probably warmer than in the late 20th century,” when the previously-rising post-Little Ice Age mean global air temperature hit a ceiling of sorts above which it has yet to penetrate. Northern Europe summer (June, July, August) temperature reconstruction. Data shown in degrees C with respect to the 1961-1990 mean. Adapted from Esper et al. (2014). And so we continue to collect ever more real-world evidence for the fact, that there is nothing unusual, unnatural or unprecedented about the Earth’s current level of warmth. Esper, J., Frank, D.C., Timonen, M., Zorita, E., Wilson, R.J.S., Luterbacher, J., Holzkamper, S., Fischer, N., Wagner, S., Nievergelt, D., Verstege, A. and Buntgen, U. 2012. Orbital forcing of tree-ring data. 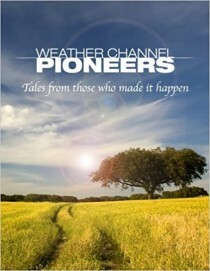 Nature Climate Change 2: 862-866. Melvin, T.M., Grudd, H. and Briffa, K.R. 2013. Potential bias in ‘updating’ tree-ring chronologies using Regional Curve Standardization: reprocessing the Tornetrask maximum-latewood-density data. The Holocene 23: 364-373. Warmist Kevin Drum on selling the global warming hoax: “...anecdotal evidence (mild winters, big hurricanes, wildfires, etc.) is probably our best bet. We should milk it for everything it’s worth” H/T Tom Nelson. See also Dr Craig Loehle’s analysis on WUWT Climate Change Impacts In The USA is Already [NOT] Happening. See John Coleman’s excellent video summary ”There is NO Significant Global Warming” on KUSI Coleman’s corner. No one communicates better to the public.